This tutorial will review the process of generating a full backup of your Joomla website and the database it is using. This is a good practice as it will ensure that if something goes wrong with your website, you will have a working copy of it. This way, you can always restore your website to it’s working state. In order to create a backup of the files of your Joomla website, you will have to download the entire Joomla directory on your personal computer. You can do so using your favourite FTP client or directly via the File Manager service within your cPanel account. The choice is entirely yours as the effect would be the same. To learn more on how to install a FTP client and access your hosting account via FTP, please visit our step by step FTP tutorials. where example.com is your domain name and “joomla30” is a subfolder on your account, this will indicate that the Joomla installation is located in a folder, called “joomla30” within the public_html/ directory of your account. Once you are sure about the location of your Joomla website on your account, you need to download the whole folder, using your FTP client. Once you find the database set on your Joomla website, you need to log into your cPanel account. Then navigate to the Databases tab and then access the phpMyAdmin service. 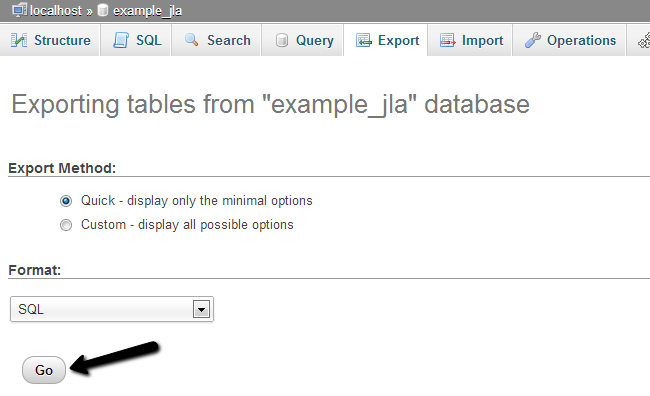 Select the database of your Joomla website from the list on the left-side of the screen.